Background: The present investigation describes all the peptides (labaditin, biobollein, curcacycline A, podacycline A, podacycline B, cyclogossine A, cyclogossine B, curcacycline B, chevalierin A, chevalierin B, chevalierin C, pohlianin A, pohlianin B, pohlianin C, mahafacyclin A, mahafacyclin B, integerrimide A, integerrimide B, JCpep7, jatrophidin, ribifolin and unnamed) isolated from the Jatropha genus reported during the last three decades in the scientific literature. Objective: To discuss the state of art of peptides belonging to Jatropha genus. Method: This report covers a joint analysis of taxonomy, botanical distribution, usage, isolation, homology, biological function and structural information of all Jatropha genus peptides. 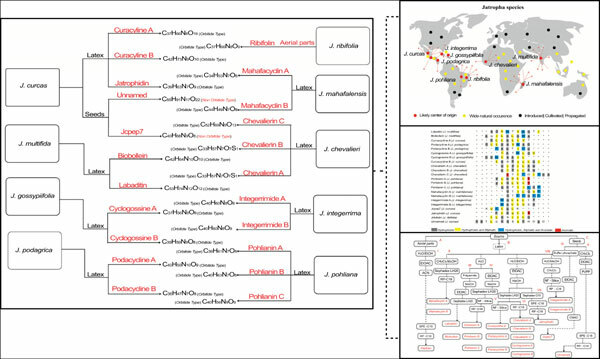 Results: It provides an up-to-date list of Jatropha genus peptides that are currently available in the literature, to facilitate and guide new strategies as well as to encourage the next generation of plant peptide researchers in this promising field. Conclusion: Even though structural elucidation, interaction mechanisms, biosynthesis and posttranslational modifications remain challenges that need to be overcome, there is little doubt that novel peptide findings will elucidate these questions and that their synthetic analogues will represent a promising future for developing therapeutic drugs. RiPPs, orbitides, caryophyllaceae-type, cyclopeptides, euphorbiaceae, latex.